Learn to play the Arabic Drum also called the 'doumbek', 'tabla' or 'darabouka'. In this class you will learn the basics of Middle Eastern rhythms and by the end of the term you will be playing together and sounding great! This class is suitable for absolute beginners as well as those with some previous experience. 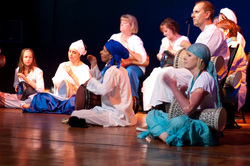 Learning to play the Arabic drum is also especially useful (though not necessary) for dancers who want to learn more about Arabic music. All ages, all levels, men and women welcome. Some drums and percussion are available for loan during class.